Alaska Air Group continues to hold its own as competitive capacity – largely from Delta Air Lines – increases in its markets. Alaska has had the capacity overhang for most of CY2014, but has managed to deliver solid financial results for the first nine months of the year. Alaska Airlines has raised some eyebrows for its own capacity push from its largest hub and headquarters in Seattle, although for the moment the additions are not creating a huge drag on its performance there. But Alaska is bracing for a competitive capacity increase throughout its network during 1Q2015 that spans double digits, and will likely drag down its unit revenue performance in the short term. As it continues to work through the new competitive dynamics ushered in by Delta in Seattle, Alaska also seems to be attempting to shore up revenues among its highest paying customers with a new first class fare structure to boost revenues in that fare category. 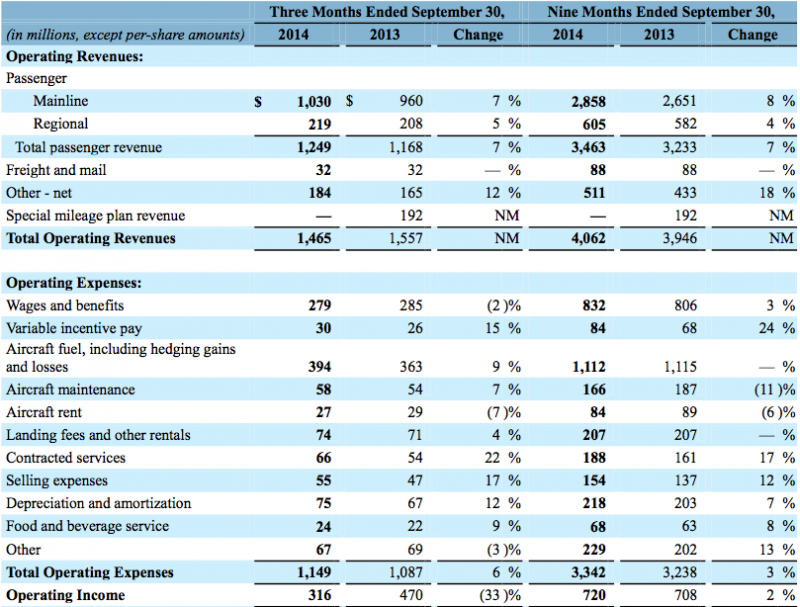 During 3Q2014 Alaska’ Airlines' profits fell to USD198 million from USD298 million year-on-year; but during the first nine months of 2014 its profits increased from USD430 million to USD457 million. The company’s passenger revenue increased 7% in 3Q2014 to USD1.2 billion, and also increased the same amount for the first nine months of 2014 to USD3.5 billion. Alaska’s operating expenses increased 6% in 3Q2014 to USD1.1 billion and 3% for the nine months ending in Sep-2014 to USD3.3 billion. Operating income fell 33% in 3Q2014 to USD316 million and notched up 2% for the 9M ending in Sep-2014 to USD720 million. Throughout CY2014 Alaska has consistently warned that the competitive capacity added in Seattle would pressure its passenger unit revenues. Recently, Alaska concluded that in Jul-2014 Delta’s daily seat share in Seattle would jump 350% year-on-year. Alaska’s consolidated passenger unit revenues fell 1% year-on-year in 3Q2014 while total unit revenues inched up 0.7%. The company recorded a 10% rise in ancillary revenue per passenger in 3Q2014 driven by increases in bag and change fees that will annualise in 1Q2015. But Alaska has also introduced a new booking class to its first class pricing structure in which the fares are lower than full first class fares “and allow us to stimulate demand in the first-class cabin as well as remain competitive with other carriers during weak periods”, Alaska SVP of planning and revenue management Andrew Harrison recently explained. During 3Q2014 Alaska estimated that its total first class revenue increased 9% or USD14 million, which resulted in a 4.6% unit revenue increase for the front of the aircraft. Its paid first class traffic grew 7ppt compared with 3Q2013, and at the end of the quarter Alaska stated it had rolled out the new first class structure in approximately 50% of its markets. It aims to add the remaining markets during 1Q2015 as it completes an upgrade of its revenue management system. Alaska estimates that roughly 10% to 12% of its revenues are generated from its highest classes “the business, first class type”, said Mr Harrison. It appears Alaska may be aiming to increase its revenue from higher yielding customers as a means to combat some of the competitive capacity incursions in Seattle. Even with the competitive capacity pressure Alaska is experiencing in Seattle, CEO Brad Tilden recently told investors that during 3Q2014 “our Seattle figures for both passengers and revenues were virtually identical to our system averages...both load factors and yields were down just a touch”. As it faces new stiff competition from Delta in Seattle, Alaska plans to grow its own capacity from its largest hub 11% by the spring of 2015 in order to bolster its strong franchise in the market. During 3Q2014 Alaska launched new service from Seattle to Albuquerque, Baltimore and Detroit. Over the course of the last year the airline has also added flights from Seattle to Tampa, New Orleans and Puerto Vallarta. It is also launching new flights from Seattle to Cancun and Los Cabos. Mr Harrison noted that Alaska has launched or announced a total of nine new nonstop markets from Seattle since the beginning of 2013, and projects the new service should generate approximately USD100 million in annual revenue when the routes are fully developed. Eight of the nine new markets have launched, said Mr Harrison, and generated a pretax margin of 11% during 3Q2014. Current schedules in CAPA and OAG (27-Oct-2014 to 2-Nov-2014) show that Alaska faces competition in two of the markets – Delta in Detroit and Southwest in Albuquerque. Given the limited competition, it seems as if the markets could spool up fairly quickly, driven by Alaska’s significant brand awareness in Seattle. As Delta has rapidly expanded in Seattle as part of a larger strategy to build-out the market as its main Asian gateway, it is obviously relying less on the historical codeshare relationship is has with Alaska. By YE2014 Delta is removing its code on Alaska’s flights from Seattle to Las Vegas, Los Angeles, San Diego, San Francisco, San Jose, Vancouver, Anchorage, Houston and Phoenix. In 3Q2014 Alaska estimated that its codeshare revenue with Delta fell 53% or USD38 million. During the first nine months of CY2013 Alaska generated USD460 million in codeshare revenue, and USD235 million of that amount was attributed to Delta. Alaska estimates that it was able to recapture 85% of the lost codeshare revenue in 3Q2014 through bolstering distribution through its own channels and generating higher codeshare and interline revenues from other airlines. Overall, interline and codeshare revenue during 3Q2014 was down only 5%. The competitive pressure Alaska faces in Seattle is settling in for the foreseeable future. But Alaska has lowered previous estimates of the competitive capacity increases it faces in 4Q2014 and 1Q2015. However, even with the lower than expected industry capacity increases Alaska acknowledges “this is still a large amount of capacity in our markets, and we continue to make necessary changes to our business in order to successfully address these pressures” Mr Harrison concluded. Alaska’s own capacity is scheduled to rise 10% year-on-year in 4Q2014 driven in party by “efficient gauge” through addition of seats to its existing Boeing 737-800/900/900ER narrowbodies. Its CY2014 capacity should increase by 7%, and in mid-Oct-2014 the airline estimated that advanced book load factor was down 0.5 points in Oct-2014, up three points in Nov-2014 and down 1.5ppt in Dec-2014. The main return travel day after the US Thanksgiving holiday in 2014 falls in Nov-2014 versus Dec-2013. Presently, Alaska is projecting consolidated capacity growth of 7% to 8% in CY2015. Mr Harrison stated the company believes that Alaska’s 17% after tax return on invested capital (ROIC) for the 12M ending Sep-2014 “warrants continued investment in our business” through capacity expansion. Alaska is all too aware of the continuing relentless competition it faces from Delta in Seattle. Up to this point, Alaska has weathered the unravelling of the relationship fairly well, evidenced by a solid top-line financial performance even if passenger unit revenues remain under pressure. By the summer 2015 Alaska has calculated that its overlap with Delta in Seattle will reach 50%, and the threat posed by Delta continues to overshadow Alaska’s strong financial position. Even as Alaska is making all the right moves to defend itself against Delta, the pressure will only intensify in 2015.